Poll: Should piranhas be a new food? With the new 1.14 Update Aquatic consisting of some more water content (yay! ), we need some real danger in the waters. Even with all of the content revealed at Minecon Earth, there hasn't really been any new danger for the ocean, or any body of water for that matter. Our first contestant on tonight's show is....The Piranha! This nasty thing would spawn in any body of water that is in a jungle biome in groups of 6, and could even be rarely fished up sometimes in the jungle (same rarity of that of the clownfish). Swamps and rivers could also rarely contain groups of piranhas. Each piranha would have 8 health ( ) and would deal 2 damage ( ). The piranha would look like how it does in the image above, but with 2d teeth in the same way chickens have 2d legs. Their teeth would tell the player that they are dangerous and not a cute little fish. When killed, a piranha would drop 3 experience, and have a 50% chance of dropping raw piranha and a 75% chance to drop 1-3 piranha teeth. Raw piranha could be cooked and eaten to restore 6 hunger points ( ) and 10 saturation points. The arrows would deal as much damage as a normal arrow, but would "pierce" through 2 armor points ( ). However, they would only go at 80% of the speed of a normal arrow. Now for the terrifying Shark! These would spawn anywhere in deep oceans, being more common as you go deeper. 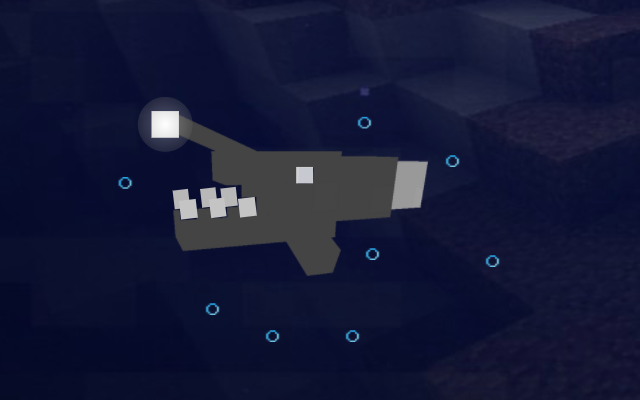 In order to spawn a shark, the spawn location would have to have water blocks in a 20-block radius (on the x/z axis) around it. 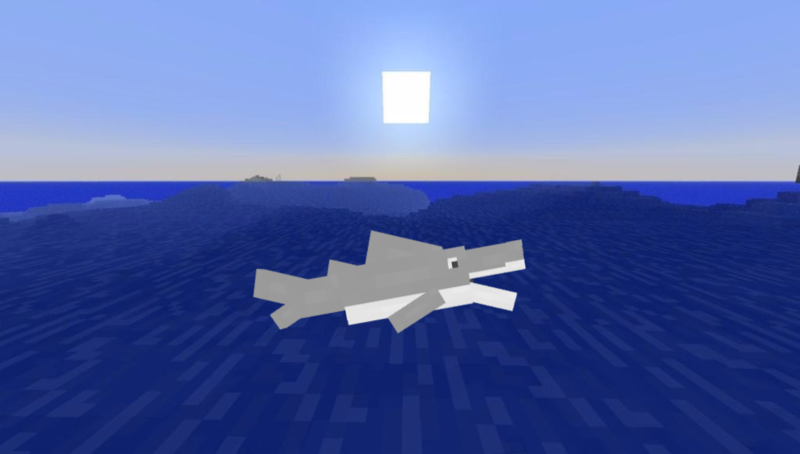 Sharks normally pursue the player from 16 blocks away, but if the player has less than full health, they will be able to pursue the player from up to 40 blocks away. Each shark would have 32 health ( x 16) and would deal 15 damage ( ) very quickly, making it an extremely dangerous mob. Eating shark fin stew gives the same effects as eating rabbit stew, but it also instantly heals 3 health ( ). Alright, we're getting to the nastiest of the nasties... The Angler! I wouldn't touch this thing with a 39 and a half foot pole. Not even in Minecraft. This guy would spawn only at the very bottom of the deep oceans, and only in low light levels. The angler would have 14 health ( ). Just like spiders and endermen have glowing eyes, the angler would have a glowing white light. When this horrific hostile creature attacks you, it would do 10 damage ( ) and give you slowness for 10 seconds. Right-clicking this block would change its brightness, allowing the player to finally configure the illumination of a block. Shift-right-clicking would turn the light completely off, and doing so again would turn it back on. If the light is off, powering it with a redstone signal would turn it on. In this case the signal strength would determine the illumination. They always, come in twos, don't they? Here is the even worse.... Breathing Angler! This guy would be just like the normal Angler, but with 18 health ( ). Additionally, this creature would take away 3 breath bubbles when it attacks you, making it extremely dangerous. However, it would not give you slowness, so you at least have a small chance to escape. Also note that this variant of the angler would have a bigger and brighter light than the normal angler. Above is a picture of the breathing angler. You can tell it's a breathing angler because it has a slightly larger light and always emits bubble particles. It would drop 3-8 angler lights. Now, you might think that seeing the light of the angler in the distance would be like a warning. However, you might actually be attracted to it. This is because of a new deep-sea block, called glowing coral. Though usually glowing white, it can sometimes glow a faint blue or green. It would resemble the dead coral, but a little brighter. The glow this would give off would look very similar to that of the angler fish, meaning you might accidentally go right into one of those nasty creatures when looking for some glowing coral. Why would you be hunting for this, though? Well, first of all, it looks cool; it's like normal coral but glowing. However, that probably wouldn't be the reason. Villagers would value this stuff very highly- so much so that you could make good profit by collecting and selling these things. It is hard to get though. It is spread out like emerald ore and hard to find. But remember: you can buy diamond tools and diamond armor from villagers if you have enough emeralds. So, this would be worth it to many players. The trade would be 2-3 Glowing Coral → 13-19 emeralds. The water could use some danger. I think we can all agree on that. Hopefully the piranhas, sharks, anglers, and breathing anglers would be sufficient. Please tell me what you think of both the mobs and the drops, and the items crafted from the drops. Yeah, I'm really hoping they implement more danger to the oceans/water than a rare miniboss structure (Ocean Monument). This would be less of a problem if Mob A had won, but sadly it didn't win. Also, I hope they fix rivers in the Update Aquatic, as well as make the mobs and coral have enough use so that we don't get more polar bears. I agree that the ocean needs threats, especially now with all the new content. I would prefer animals be neutral, like polar bears, but this whole suggestion is about hostile threats so I won't put up that fight. Piranhas: This would be cool with the new fish mobs. By being biome specific it would provide further reasons to go journey through the world. However, I would suggest they only drop teeth. We have enough food already. But besides that support. Sharks: Still like the idea of sharks, though I still say they should be neutral. 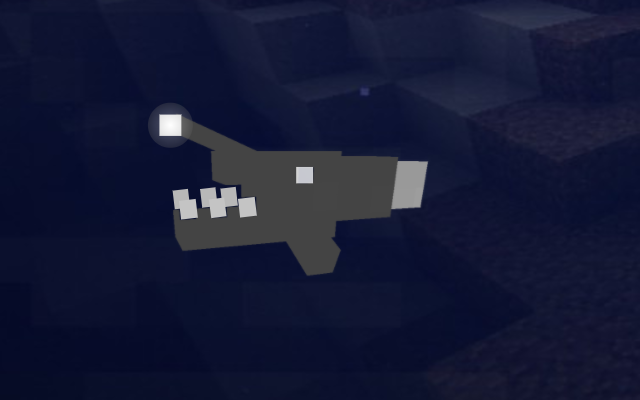 I also think the texture should change to something more dangerous, right now the shark looks more like a happy dolphin. My biggest concern is shark fin soup- China did a huge campaign against shark fin soup, a very popular dish there, which was driving sharks extinct. I don't think one of the most popular games in the world encouraging players to kill sharks for shark fin soup would be well received by people. Anglers: This is the one I like the most, it feels perfect. It's looks and acts like a monster already, so it can be hostile just fine. It lives as the very bottom of the ocean, so it wouldn't be an inconvenience to those that just a boat ride. And it looks really cool. Breathing Anglers: I don't see why this has to be a variant to Anglers. The behavior is nothing like Anglers, so why should it look like them? I think this should be an electric eel instead. It makes perfect sense for the behavior (slowness = shock from getting zapped). 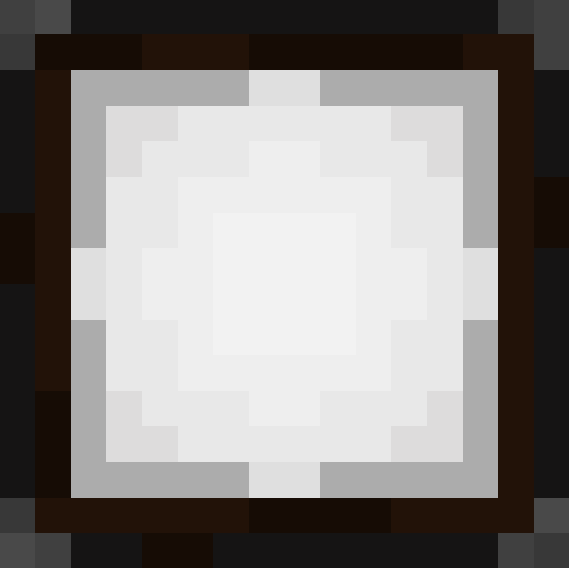 Maybe even call it a redstone eel to better fit the game, having red eyes and dropping redstone. 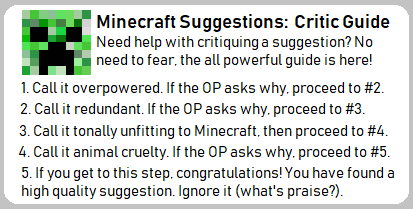 All in all this is a good suggestion that I would like to see in Minecraft. I have some nitpicks, but for the most part I like the general idea of danger in the oceans. I wanted to add the piranhas as a food to be consistent (there are being mobs made of the current fish items) and because piranha is actually a food and I thought it would be interesting to have them in the game. I'll add a poll for it. I understand the shark fin soup/stew thing. However, I didn't want to just copy and paste the shark part from Ocean Improvements Part II. Also, I thought having shark also drop teeth would be too similar to the piranhas dropping teeth. Is there anything you think would be a better drop? Please let me know. Also, should I add teeth to the shark to make it scarier? The breathing anglers don't give you slowness. The normal anglers do that. The breathing anglers take away breath bubbles. I like the idea of having a redstone eel though. Mind if I use it? I'll credit you. Maybe piranha meat could be obtained through fishing? 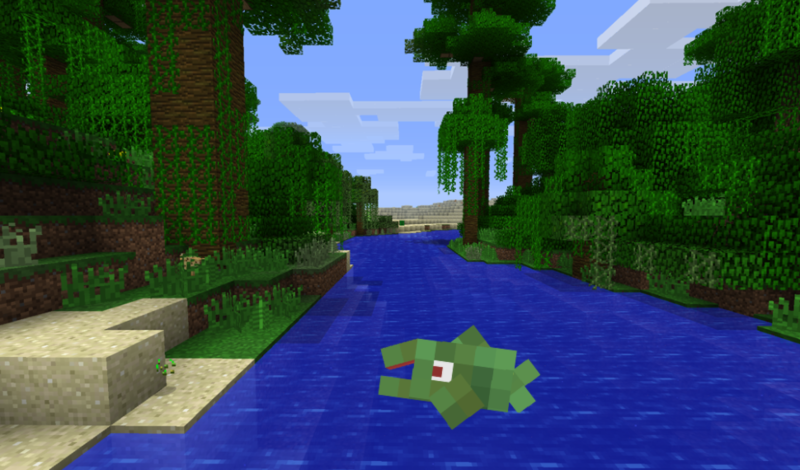 It depends on how Mojang goes about adding fish mobs in, if all fish drop themselves then so should piranhas. But I don't think that would be a good idea because it'd make fishing redundant. So tbh I don't know what to answer on the poll. I cant really think of anything better. Maybe sharks still drop their fins, but the fin is used for a new potion? Anything besides shark fin soup should be fine. Or maybe shark fins have a high trading value for villagers. Teeth would help make it scarier. Oh my mistake, I remember reading that but when I was typing my response I must have mixed them up. In that case, if you wanted to do the eel (you have my permission on any thread where I suggest a possible change) instead of breathing anglers you could just make normal anglers do the breathing effect. Even though the models aren't perfect, they're much better than nothing. EDIT: Reading that back to back sounds weird. What kind of potion should the fin be used for? Maybe it could be something that has the same effect as depths strider, but increases your movement speed for going up and down? I’m a little torn on whether to have breathing anglers or not. I like the concept of a mob that takes away bubbles from your breath bar, but I feel like having that all the time would make it too difficult.